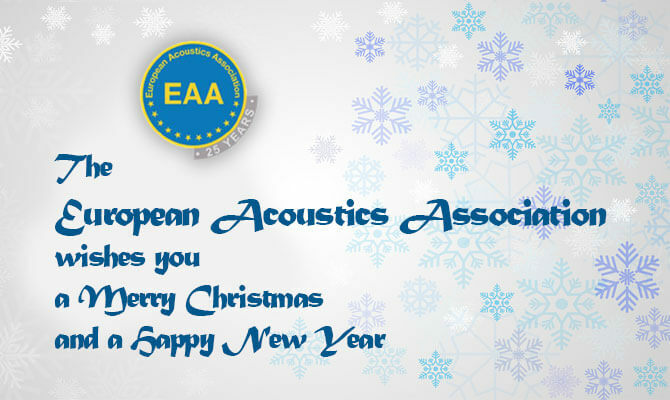 On behalf of the European Acoustics Association I want to wish you all, and to your relatives and friends, a Merry Christmas and a Happy New Year. During this year, we have once again lived stressful times. But, luckily, the Human genre has always overcome the occasional emergence of terrible situations, continuing to go further for the benefit and progress of all Society. And here we are reaching the end of another year! Unfortunately, some colleagues have already left us, but we are sure it's our duty to assure the continuity of their legacy. This year EAA completed its 25th anniversary, a distinguished and very remarkable age. Throughout time EAA has pursued its goals and fulfilled its duties by promoting international activities and supporting scientific and technical events, such as symposia, conferences, etc., thus gathering all those working and interested in acoustics under the same umbrella of exchanging and promotion of knowledge and technical development. But EAA does not forget other duties such as, the engagement in social actions addressed to develop conditions for a better quality of life in terms of acoustic environments. In this regard, within the frame of INAD (International Noise Awareness Day), I must highlight the coordination of the Pan-European Competition for students under the leitmotif The Sounds of my Place, and the collaboration with the DG-ENV of the European Commission (EC) for the organization of an important event held in Brussels on March 24th. Both these two commitments were very well succeeded and internationally recognized. The EAA has assured the continuous publication and needed updates of its products (Nuntius, Acta Acustica, Documenta, Scholla, Acoustics in Practice, Index), spreading and providing oriented news and information of interest to all community through its member societies and their institutional means, thus linking all together under the same frame of knowledge and scientific advances. One of EAA major events is the FORUM ACUSTICUM. This year the Forum was held in Boston, USA, in a format of a joint meeting with ASA. It was a great success of EAA cooperation. Around 2500 attendees were there sharing information, creating partnerships, showing their work and making new acquaintances. Two important EAA Awards were there presented to distinguished colleagues: Antonio Pérez-López for “Contributions to the promotion of Acoustics in Europe”, and Hugo Fastl for “Lifetime achievements in Acoustics”. Next year, from 27th to 31st May 2018, will be held, in Crete, Greece, another important EAA event, the EURONOISE2018, organized by our colleagues of the Acoustical Society of Greece (HELINA); http://www.euronoise2018.eu/index.php. This event will feature a large amount of topics and special structured sessions which will be of utmost interest to all of us. Do not forget to put in your agenda this scientific meeting. There is no doubt that throughout 2017 EAA has been a key partner in all actions associated with noise nuisance, control, management and corresponding adverse effects. The sponsorship given to the production of the film “in Pursuit of Silence”, which was released this year, and the recent participation of EAA in the EC Noise Experts Group as privileged advisor to Noise Control Policy in Europe are good proofs of this. In this times dedicated to family, inner reflexions and solidarity, all members of the Board (Brigitte Schulte-Fortkamp, Giovanni Brambilla, Salvador Santiago, Jerzy Viciak) and the EAA Office, Antonio Pérez-López, have kindly joined me in wishing you a Holy Christmas and a Happy New Year.